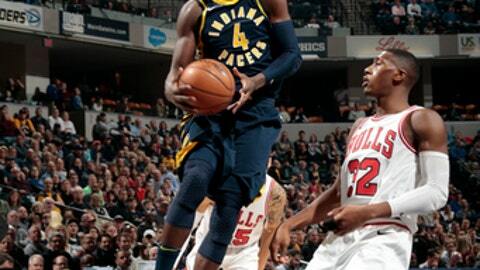 INDIANAPOLIS (AP) Victor Oladipo gave the Pacers they needed to end a five-game losing streak. Oladipo had 23 points and nine assists in three quarters in his return from a right knee injury to help the Pacers beat the Chicago Bulls 125-86 on Saturday night. Oladipo also had six rebounds and five steals after missing the previous four games. Domantas Sabonis added 22 points, and TJ Leaf had 15. But it was Oladipo who stole the show and led a surge to put the game away by halftime. Four of Oladipo’s steals came on consecutive possession during a 16-2 run in the first quarter. He broke away after his fourth steal and made a two-handed dunk to make it 24:17 with 4:51 left in period and then looked into the stands with both arms up to signify he was back after a stretch the seemed longer than four games. The big run in the opening quarter ended with a technical free throw by Darren Collison and a basket by Sabonis to take a 31-19 lead with 2:43 remaining in the first period. They went on a 14-0 run in the second quarter to go ahead 48-28. Thaddeus Young scored on a turnaround hook shot to give the Pacers a 64-37 halftime lead. Bobby Portis had 15 points, and Denzel Valentine and Lauri Markkanen each had 13 points and five rebounds for the Bulls. They’ve lost four of their last five games and their defensive woes haven’t gotten much better. Opponents have shot 49.3 percent against Chicago over the last five games. The Pacers finished 55.8 percent from the field. Indiana led by as much as 41 points when Leaf dunked to make it 116-75 with 5:30 left to play. Bulls: Shot just 37.5 percent from the field. … Kris Dunn had eight points and eight assists. . Markkanen has scored in double figures in all four matchups with Indiana this season. Pacers: Forward Bojan Bogdanovic was out with a sprained left ankle. … Indiana won three games in a season against Chicago for the first time since 2012-13. … Leaf had a career-high six rebounds. Hoiberg said the Bulls plan on taking the day off Sunday and they could use the rest. The ream arrived in Indianapolis at 3 a.m. Saturday after beating Dallas 127-124 on Friday, and completed a stretch of seven games in 11 days. Chicago is 2-7 in games when playing the day before. The Pacers-Bulls matchup capped off Basketball Day in the Hoosier state, where the sport is so popular. It was nearly 13 hours of nonstop basketball, which featured the top high school teams in the state and college games including Purdue, Indiana, Butler and Valparaiso before the Pacers and Bulls tipped off. Bulls: Host Houston on Monday night. Pacers: Host Milwaukee on Monday night.